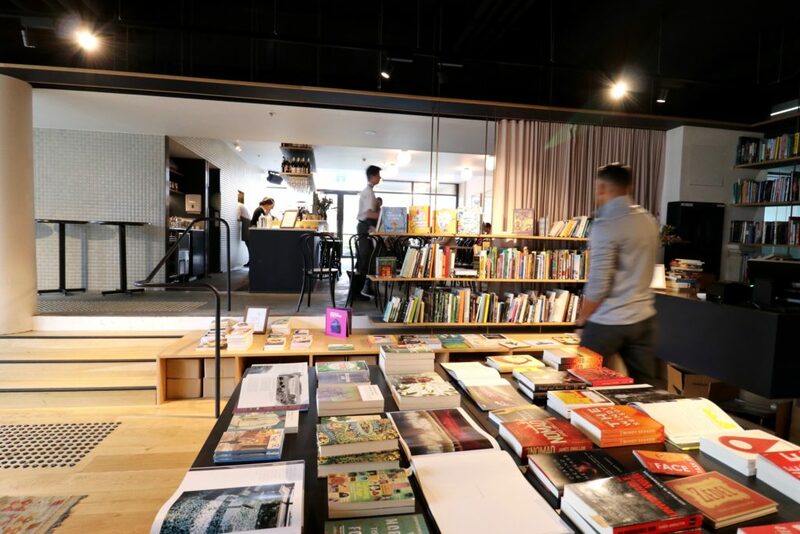 East Hotel Canberra: A Weekend of Good Food, Truffles and Books - Holy Smithereens! If there’s one thing I’m completely guilty of, its this: I rarely explore my own backyard. It’s always been a New Year’s resolution year after year: Explore more of Australia / Canberra! Well I’m pleased to say that I made a bit of an effort in that early this year, when I went to Tasmania and Mornington Peninsula for personal trips, but I do need to discover more of where I’m actually based. 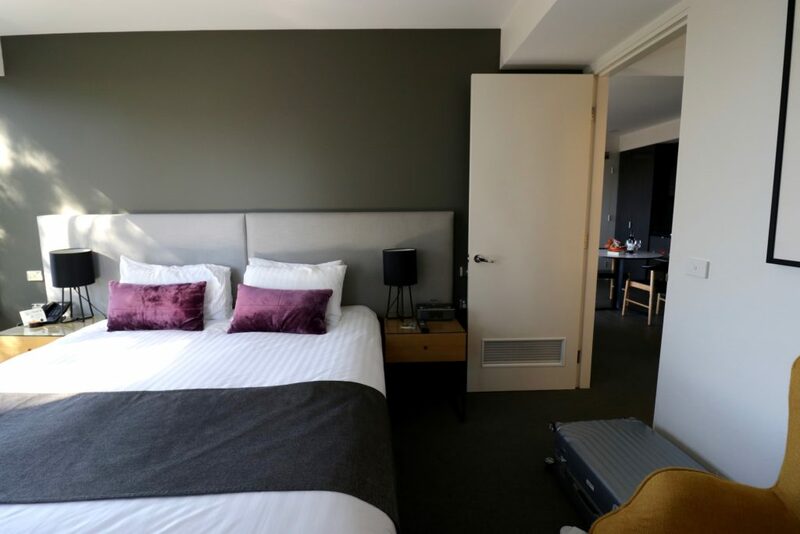 East Hotel is located on the south side of Canberra, nestled between the hubs of Kingston and Manuka. Just a short drive from where we live, Zombie and I arrived on a Friday night. 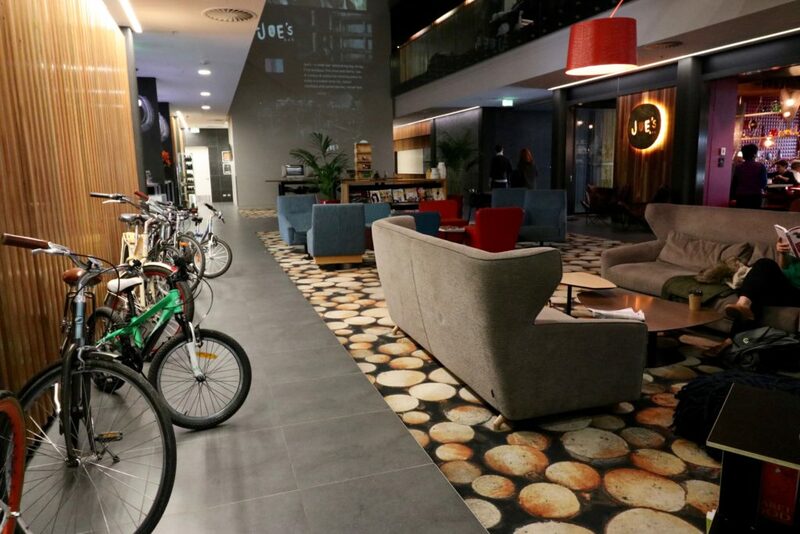 East Hotel is currently voted on TripAdvisor as Canberra’s #1 hotel, and we’re about to find out why. Like most buildings in the area, the East Hotel looks very nondescript from the outside. But the moment we stepped inside, I immediately felt the character of the place. We were greeted very warmly at reception, and didn’t have to wait to be attended to. 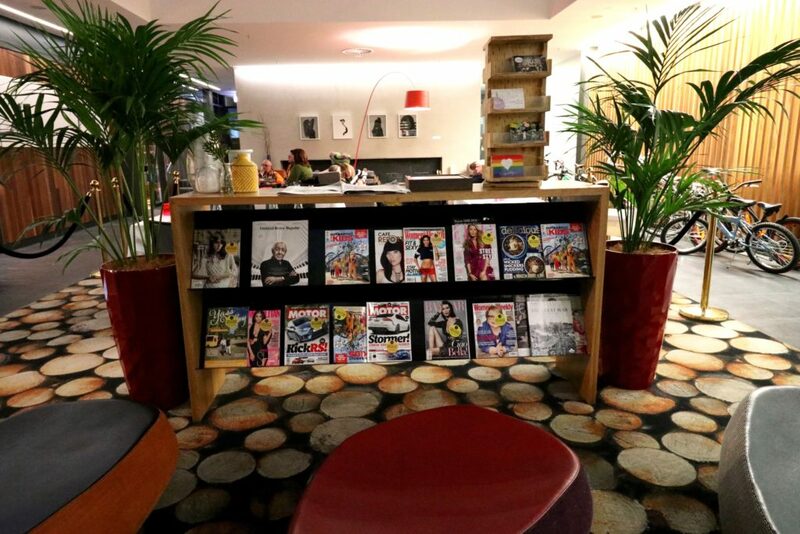 Before we made our way up to our room / apartment, we espied a magazine rack filled with interesting reads. The receptionist said we can take any up to our room for reading. 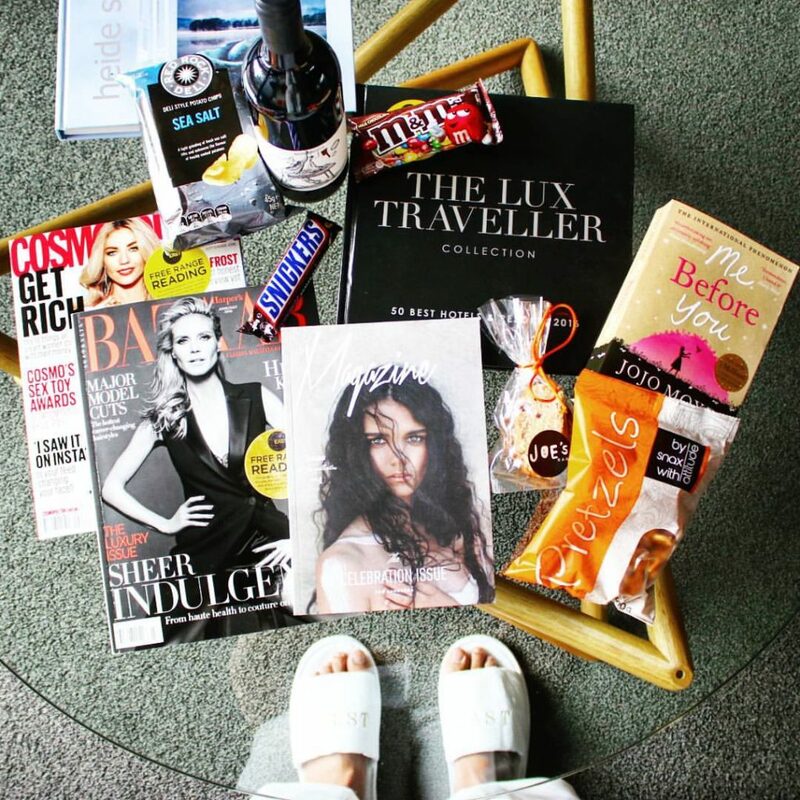 I grabbed a couple of magazines, and together with the already existing reading material in our room, snacks, and the book I brought and finished that weekend, I had a nice stash of staycation paraphernalia for the weekend. 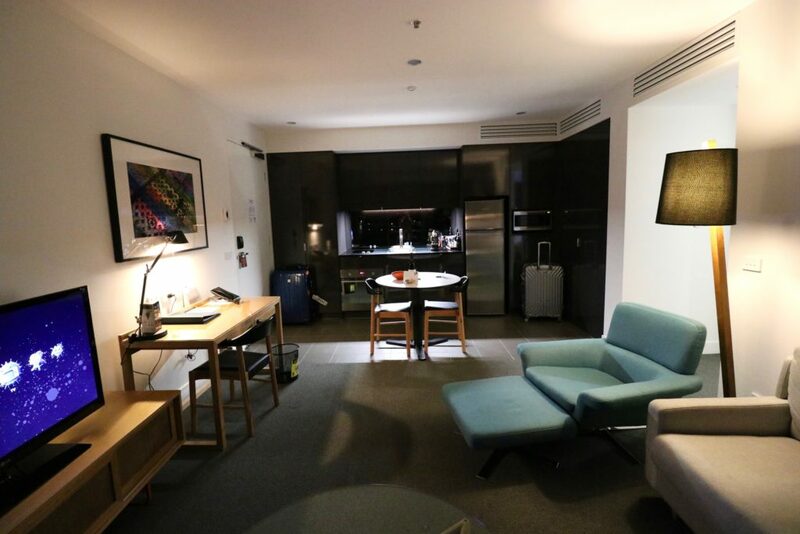 We stayed in a 57 square metre apartment, where I can imagine easily staying long-term. It’s complete with a fully-furnished kitchen and even a dryer and a washing machine. I had such comfortable sleeps (even indulged myself in a siesta!) in this bed. The pillows were also amazing. And the best part of this bedroom is that it has dual power outlets of both sides of the bed- such a luxury, really as even some 5-star hotels can’t grasp the necessity of this! The One Bedroom Luxe Apartment features a 4-point bathroom – there’s a separate area for the toilet, shower, jacuzzi, and sink. 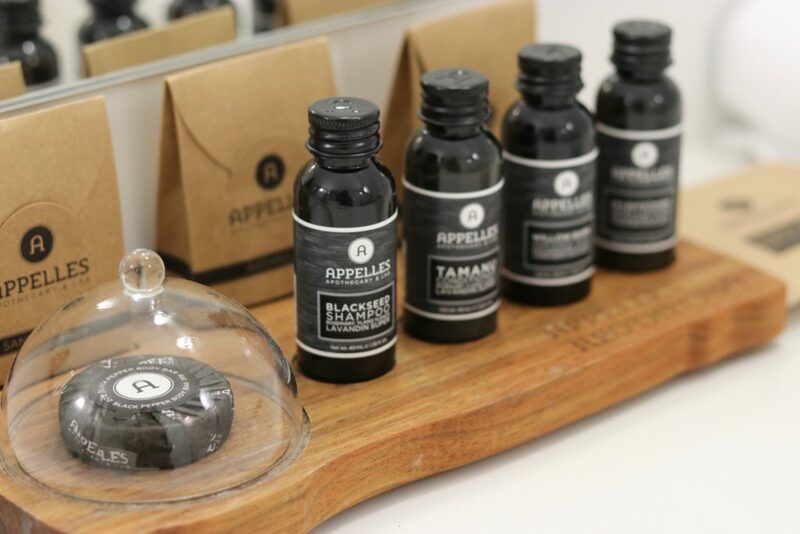 Toiletries were from Appelles Apothecary, a Victorian based Australian skin care company. I especially loved their Sea Buckthorn body lotion – it had a gentle concoction of scents that I love ( Juniper berry, cedarwood and patchouli) so it was sweet yet had a light undertone of musk. I am the last person to rise early for breakfast. 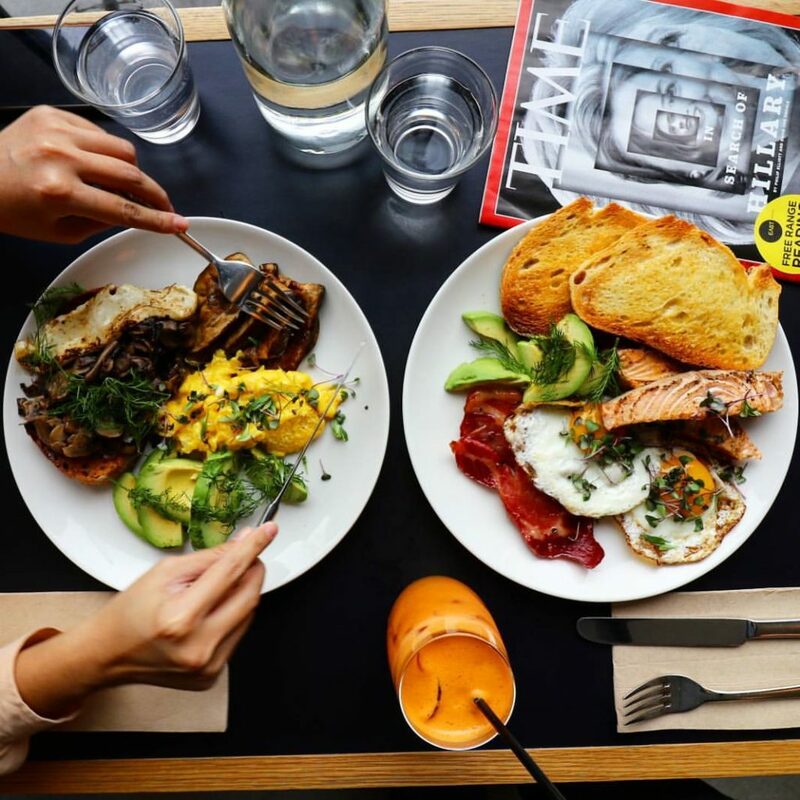 You’re either a breakfast person or not. And I’m one who treasures sleeping in more. But when I found out that East Hotel serves breakfast at Muse, a place that offers books and food – I was up even before my alarm. The place was buzzing and packed when we arrived. It was a Saturday morning and many Canberrans seem to also love that intoxicating scent of pages and coffee. They serve breakfast until 10:30 AM, but they still welcome guests close to 10:30 AM so it’s also a great place to brunch. Breakfast is served ala carte so this is not your usual hotel buffet breakfast, and I loved the concept. 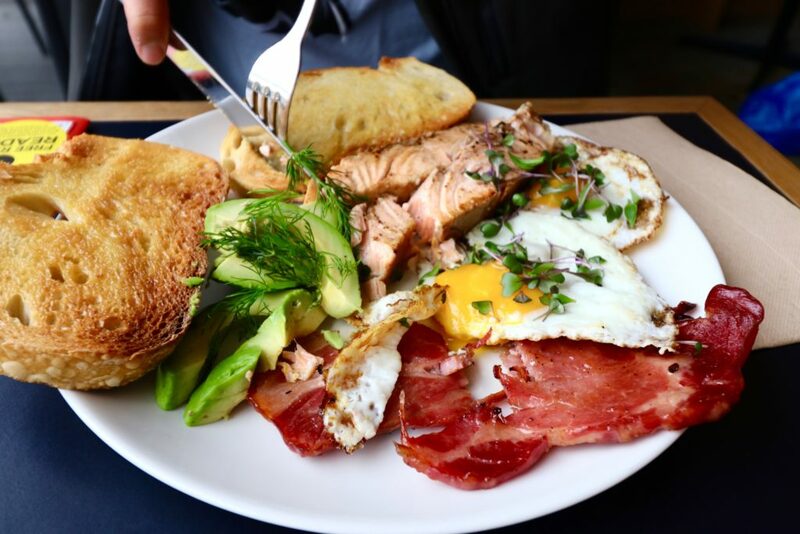 Zombie had their Grilled house smoked salmon, sourdough, eggs, bacon and avocado. I had a bit of plate envy and tried his salmon. It was really good. My plate was filled with flavours too! 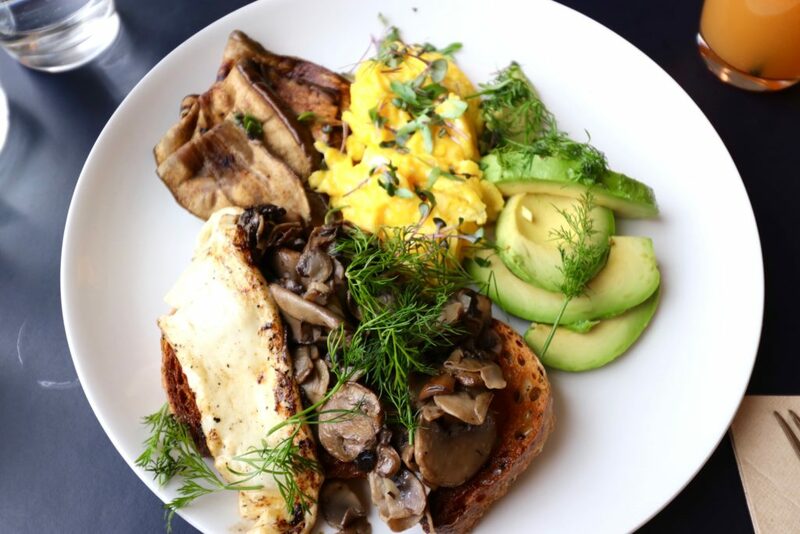 I had pan-fried mushroom bruschetta, haloumi, ten-grain sourdough, scrambled eggs, avocado and eggplant ‘bacon’ (like caramelised eggplant). This is normally served with basil pesto but I opted to have it without. All ingredients were fresh and it was a rare moment for me to have an extremely slow and leisurely breakfast (I’m normally an eat and up you go person especially if its in the morning!). 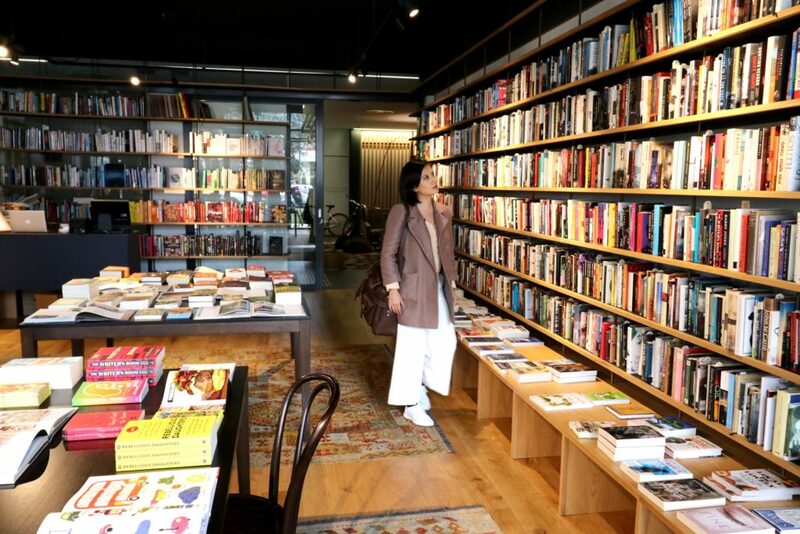 After breakfast, I lingered around the bookshop area and got to have a brief chat with owner Dan, who shared that he and his partner were inspired to open Muse after living in Beijing, where there are many themed restaurants. 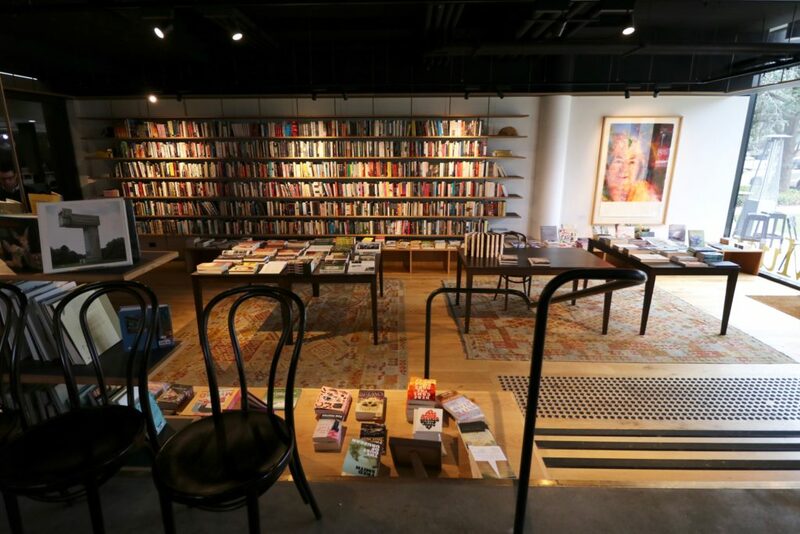 Browsing through the shelves felt like taking a peek out of someone’s personal bookshelf. There was a huge variety of books ranging from children’s to popular novels and biographies. 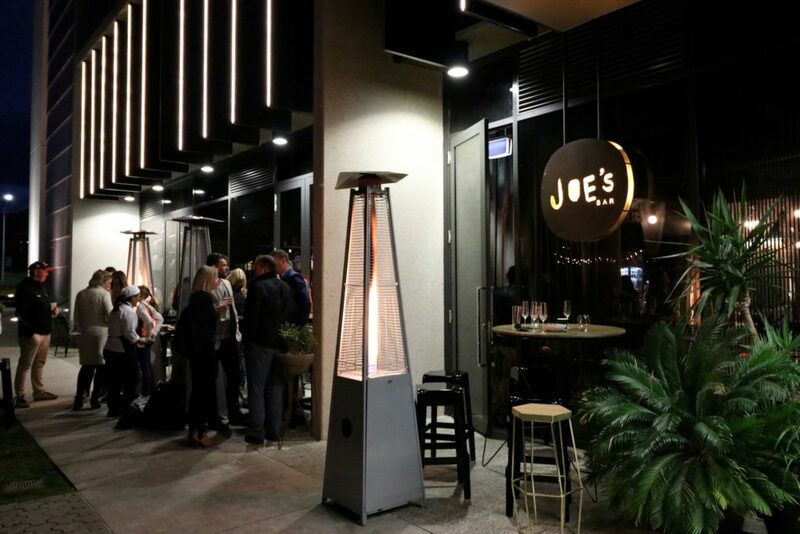 East Hotel is also home to Joe’s Bar, which describes itself as “a small bar celebrating big things.” And that couldn’t be more evident on that Saturday evening, when we had dinner at Joe’s Bar. 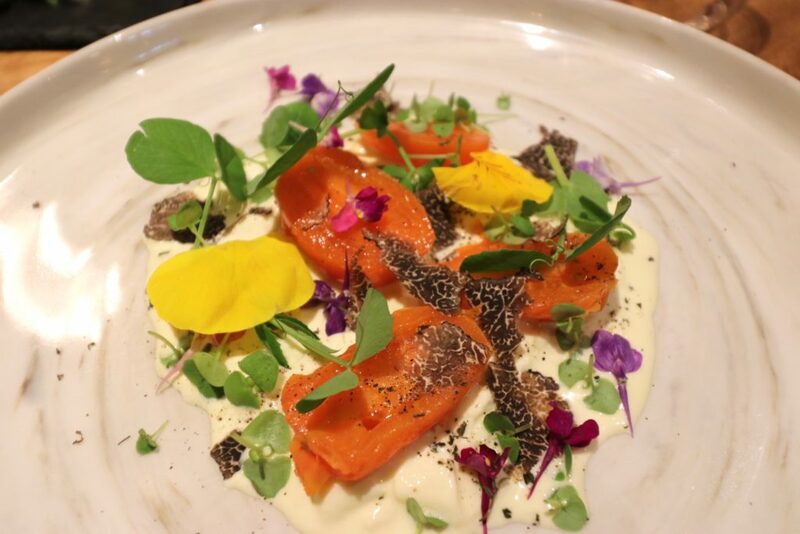 This Entree was my favourite, the creamy Stracciatella cheese went really well with the fresh tomatoes and shavings of truffle. 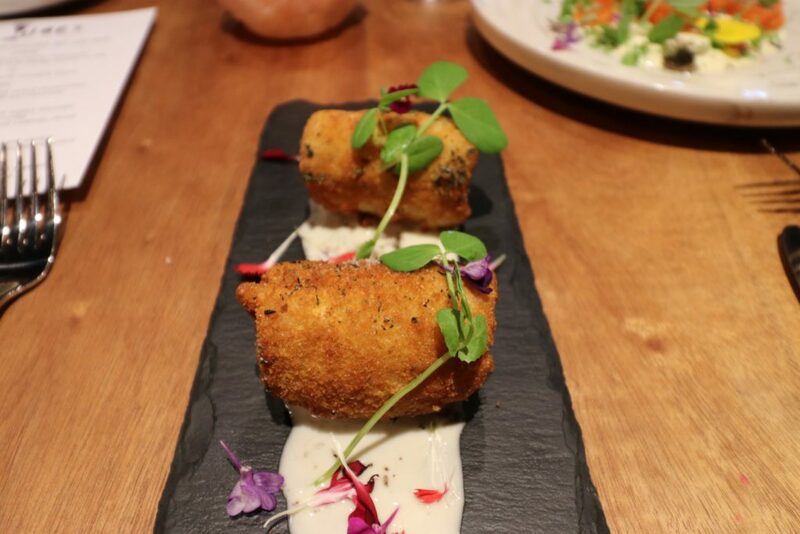 For a different textured entree, there’s also the Truffle Arancini, which I’m glad was only two pieces as they can be slightly heavy for an entree, but they were wonderful as well. 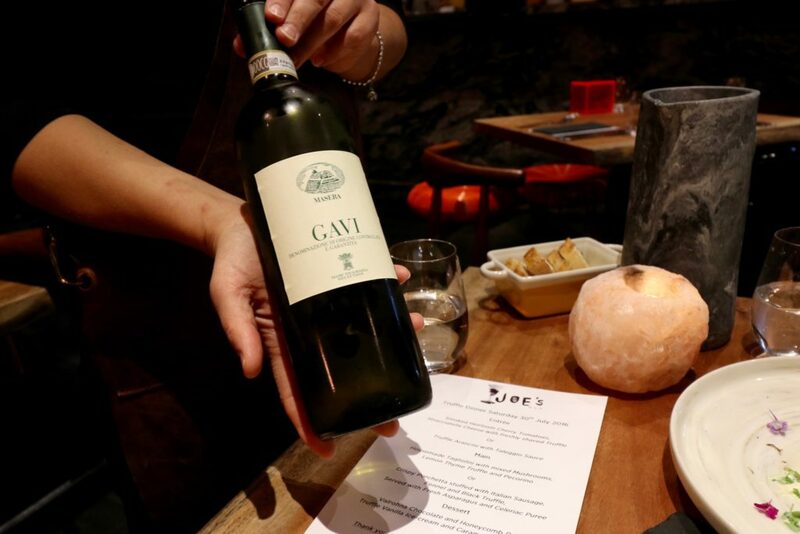 The three-course dinner in itself costs AUD 85.00 per person, and there is an option to do a wine pairing through all the courses for AUD 110.00 per person. There were two choices of Mains and what I had was the housemade Tagliolini with mixed mushrooms, lemon thyme , truffle and pecorino. 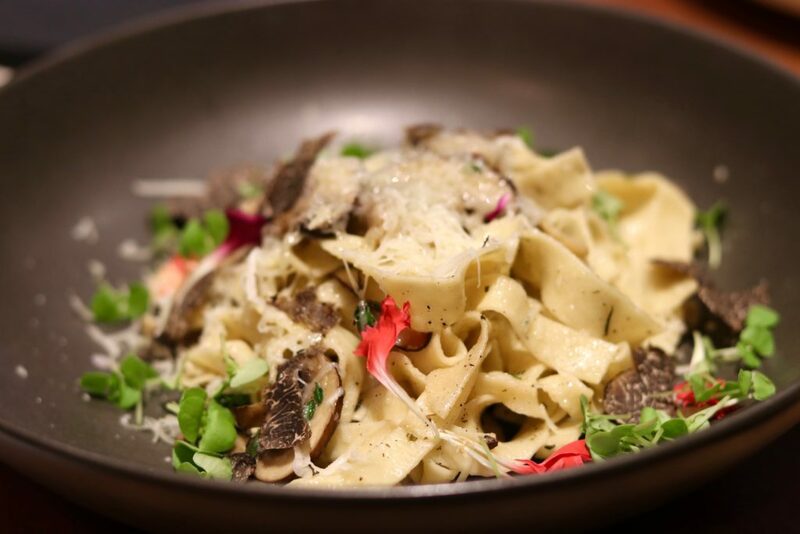 The housemade tagliolini was perfectly firm and the lemon thyme balanced the earthy aroma of truffle. Meat lovers will certainly enjoy the second main meal. 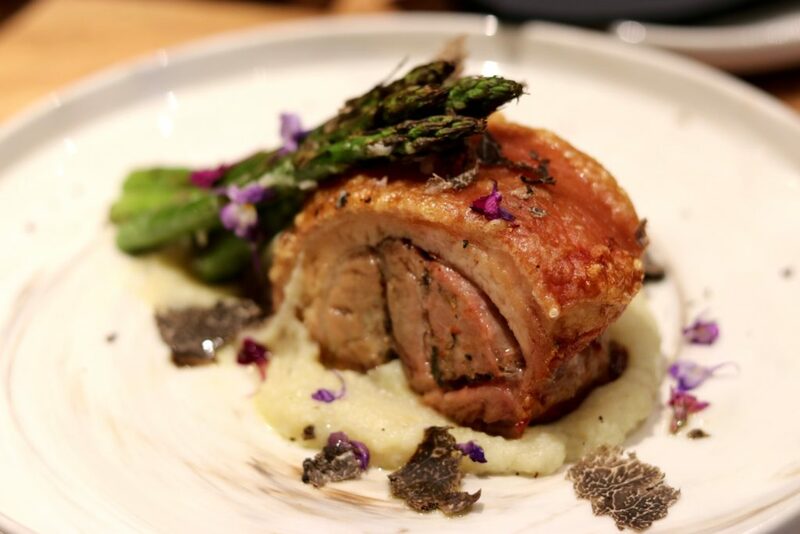 It was porchetta stuffed with Italian Sausage fennel and black truffle. Zombie enjoyed this dish and loved the crispy skin of the porchetta. I enjoyed the dinner but it was this dessert that really brought me down to my knees (ok, almost) and had me whimpering with delight with every single bite. 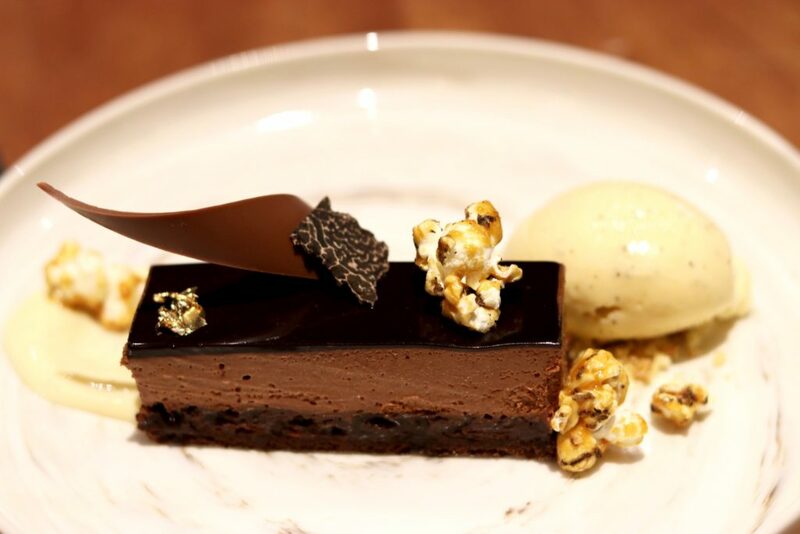 Valrohna Chocolate and Honeycomb Delice, Truffle Vanilla Ice Cream and Caramel Truffle Popcorn. I cannot remember having such a rich velvety dessert, with a medley of perfect textures as well. The use of truffle in the dessert made it not overly sweet and I was in absolute heaven. And with a light swig of my dessert wine (locally sourced in Canberra), I was extremely satisfied with this dinner that is so perfect for a winter’s night. 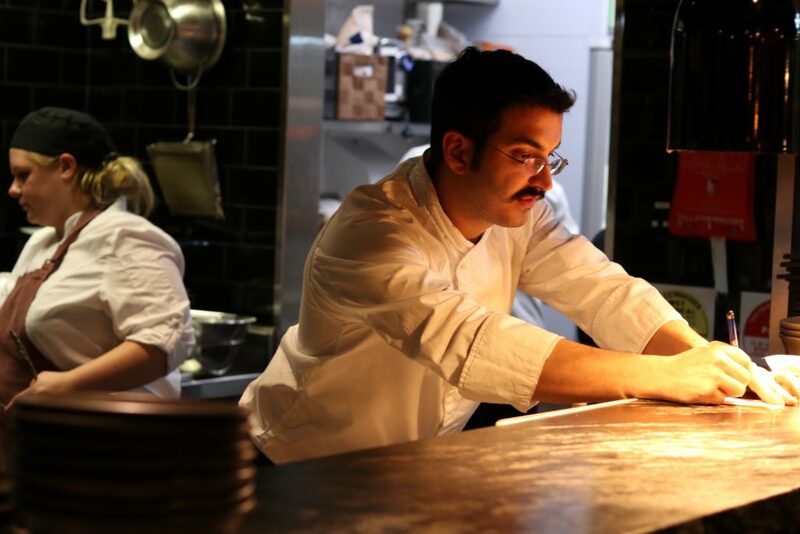 Now amidst all the warm chatter and satisfied diners that flocked Joe’s Bar that night, a very busy (but beaming with pride) Exec Chef Francesco Balestriri is running the show from his kitchen. A native of Rome, Francesco came to live in Canberra seven years ago and has been part of Joe’s and East Hotel since it opened in 2012. And despite having had a very busy day (week and month), you cannot see any signs of exhaustion or fatigue from Francesco, just pure excitement and passion. He speaks excitedly about a new restaurant that they will open at East Hotel. He won’t say too much but hinted that it will be an entirely different concept and atmosphere from Joe’s and Muse so this is another exciting space to watch out. 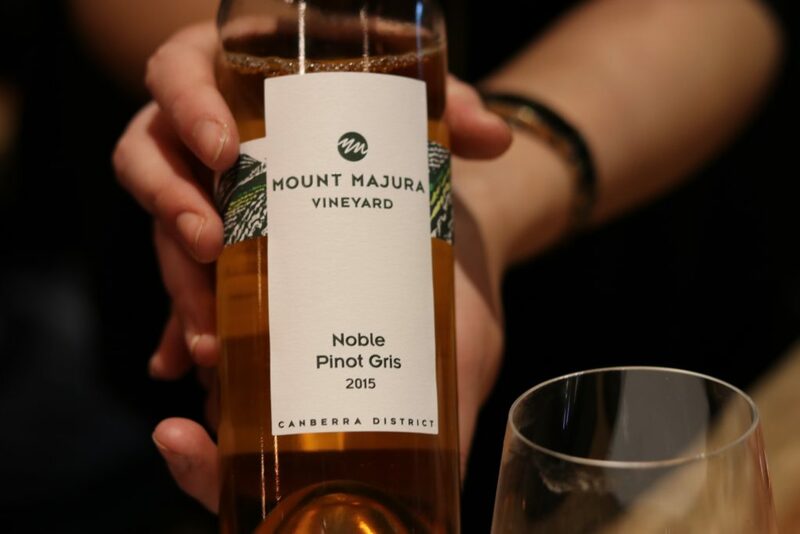 There’s been a lot of changes (good changes) in Canberra’s hotel and food scene in the last 5 years. And it is big thanks to people like the Bisa family (owners of East Hotel) who try and innovate and push forward ideas that ten years ago cannot even be imagined to exist in Canberra. 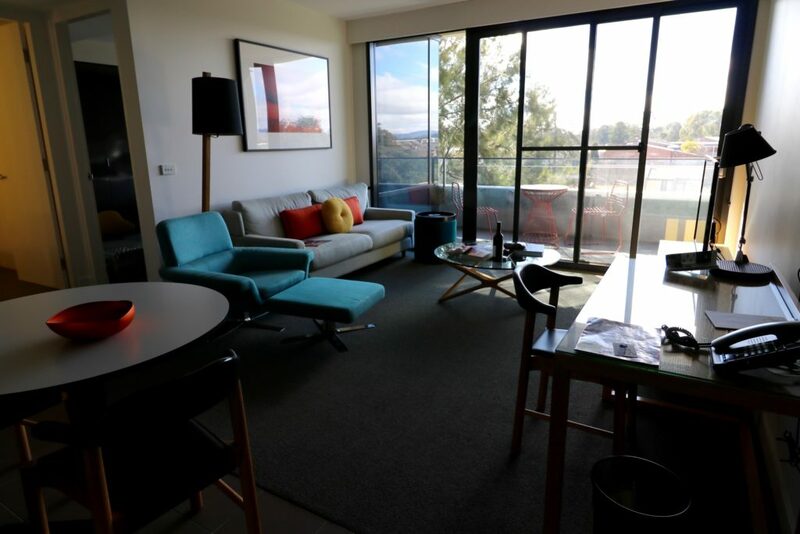 East Hotel is growing, and I’m excited to see what further changes it will contribute to Canberra’s food and hotel scene. Have you been to Canberra? What do you love about it? Also, do you love exploring where you live or are you guilty like me, of visiting other places more? 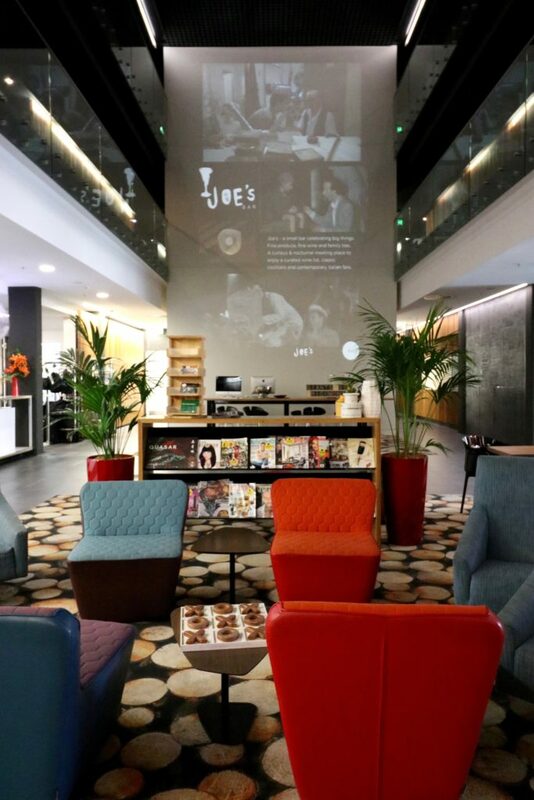 We were guests of East Hotel Canberra, Joe's Bar and Muse. There is no obligation to write a favourable review, all thoughts and opinions are mine. 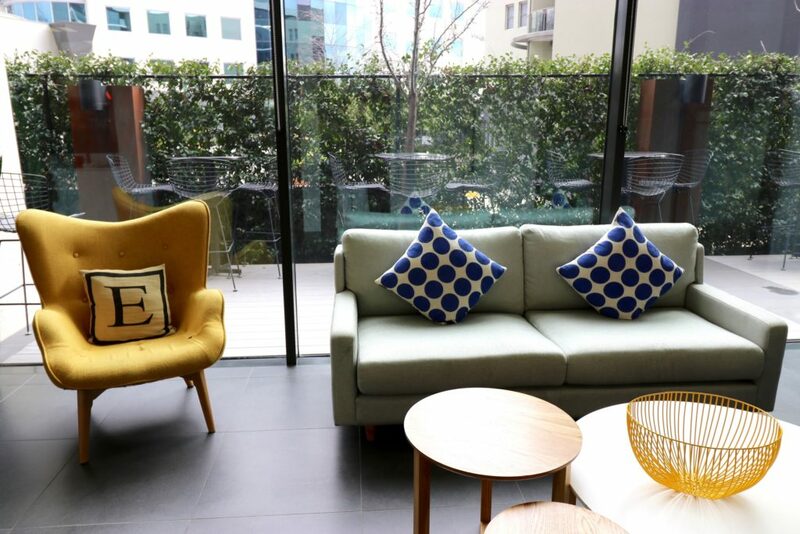 A One-Bedroom Luxe Apartment at East Hotel begins at AUD 310.00 a night. This rate is subject to availability and season. You know what I love most about this post? That you went forth and enjoyed some of the wonderful things in Canberra, honestly, I am so incredibly lazy when it comes to staycationing. Ha, is that even a word? 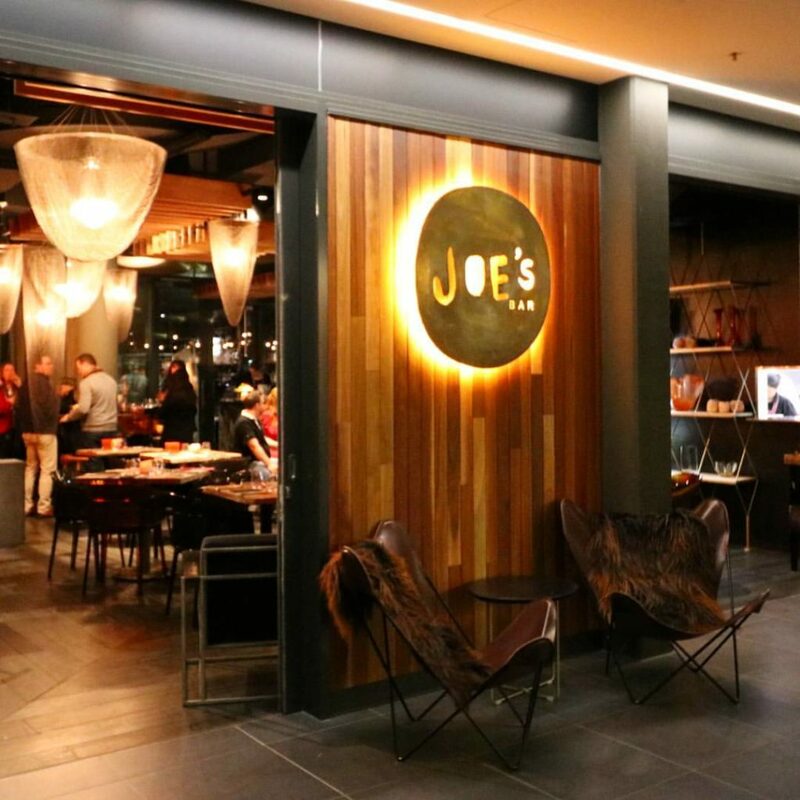 Joes is one of the best places in town to grab a cocktail, they are just that little bit different and oh so tasty. Not to mention some of the finest food around. 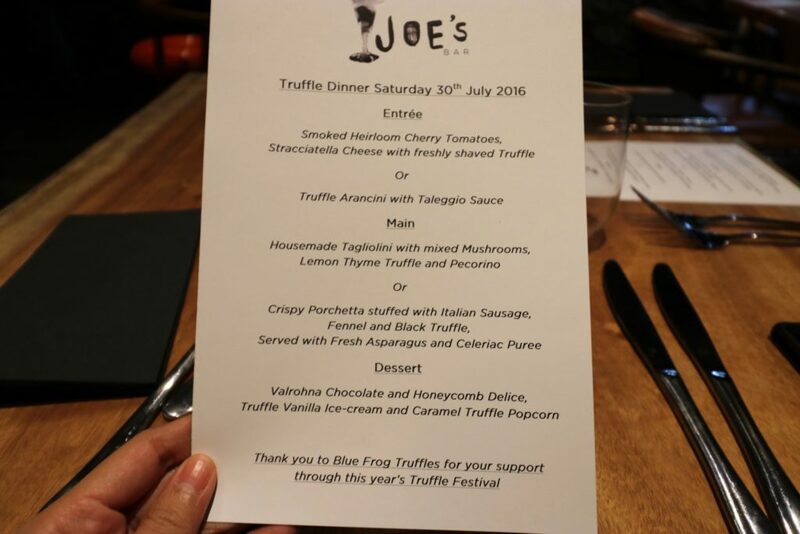 The truffles from The Truffle Farm served there are AWESOME too. I reckon Canberra is a pretty great city to live, we have the best of all the worlds, city, bush, amazing food and soon… and an International airport too. 🙂 🙂 🙂 Good to see you enjoying lovely. Hi Anna! 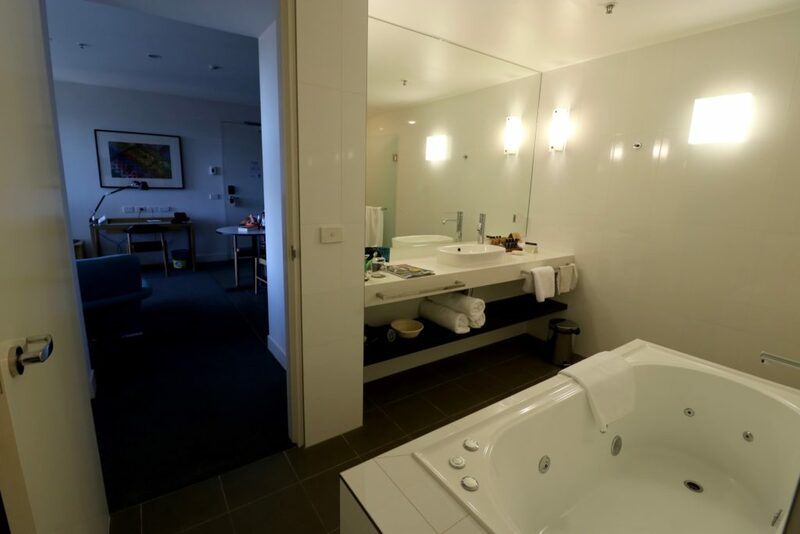 Thanks so much, I too am proud of myself that I went out and enjoyed myself in Canberra 🙂 Staycationing is quite an effort actually – because you are already cocooned in your own cozy home so I understand what you mean. But making the effort to go out and take the 5 minute drive to a different environment can be actually invigorating. Yes, I am enjoying the quiet life in Canberra when I’m here it is my respite from the travels. And so exciting about the airport being International now too… direct Singapore flights next month!